The past years have left some scars. Recent life events of sorts have left me a bit tattered and in need of repair. 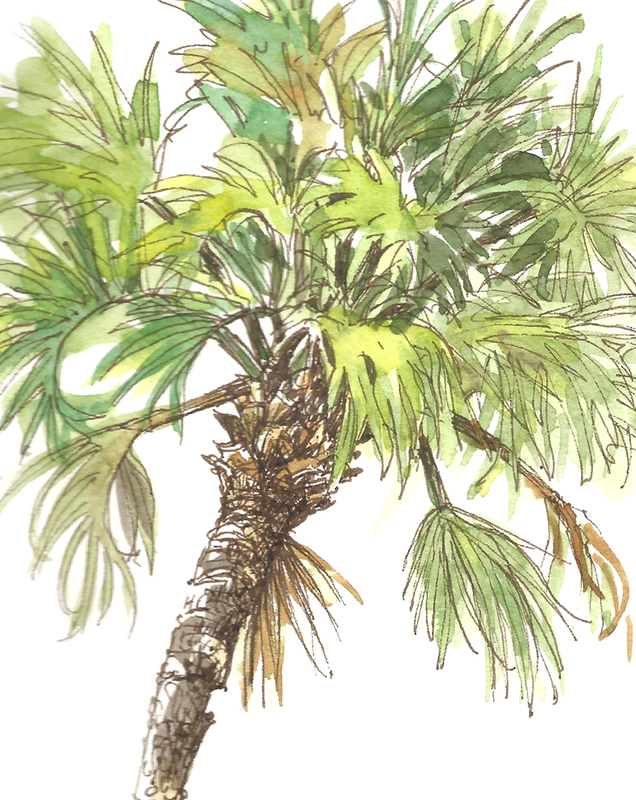 No wonder this cabbage palm attracted my pen and brush. This one has had experiences that have left their marks as well. 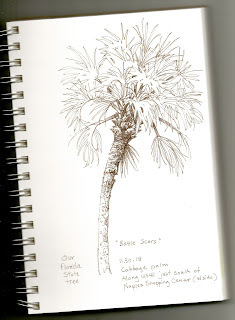 Cabbage palms in general seem to be always present in our area but seldom noticed. They are like the fairytale stepchild of landscaping; going about their business in the background but never the star of the show. Yet… they provide so much and ask for so little. And to me they are beautiful in many ways. 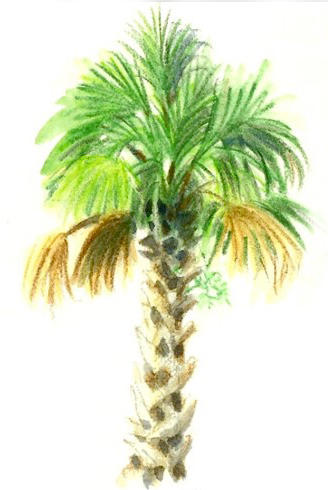 The cabbage palm, or Sabal palmetto, is our Florida state tree (as well as that of South Carolina). You might say that Florida was built with this amazing palm. Early life in Florida was easier because of it. The growing bud was harvested as food, the berries used medicinally, and the trunks became lumber, utensils, game sticks, and hunting implements. The matted fiber tucked behind the “boots” makes excellent kindling, as boy scouts learn on overnight adventures. Boots are the old leaf bases that criss-cross in a spiral around the trunk. The boots are not always present – sometimes removed by landscapers but they also show up that way in the wild, perhaps removed by fire or time. The fronds can be woven into mats, bowls, hats, and baskets. They are used for roofing chickee huts, for making rope, twine, and thread. Cabbage palms support a variety of wildlife. Birds and small mammals eat the berries and find shelter in its fronds (not to mention a friendly rat snake or two). Larger mammals eat the reachable or fallen berries. The small white-to-cream flowers provide nectar for insects and bees, which in turn make flavorful honey. Frogs and anoles make their home in the canopy. It even provides larval food for the Monk Skipper butterfly. Just one cabbage palm might be thought of as a mini-eco system. Wow. My original sketch in pen. With all of these gifts, we often turn to this palm only as a way to fulfill our native landscaping quota for new construction. They grow in a wide range of conditions (salt, drought, and wind tolerant), are available everywhere, and reasonably priced (as palms go). 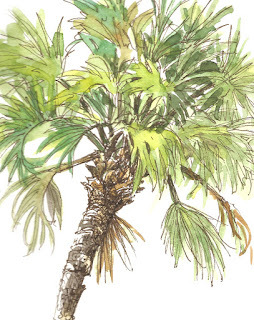 This hardy native palm is found naturally throughout Florida and along the coastal plains of Texas and up into North Carolina. 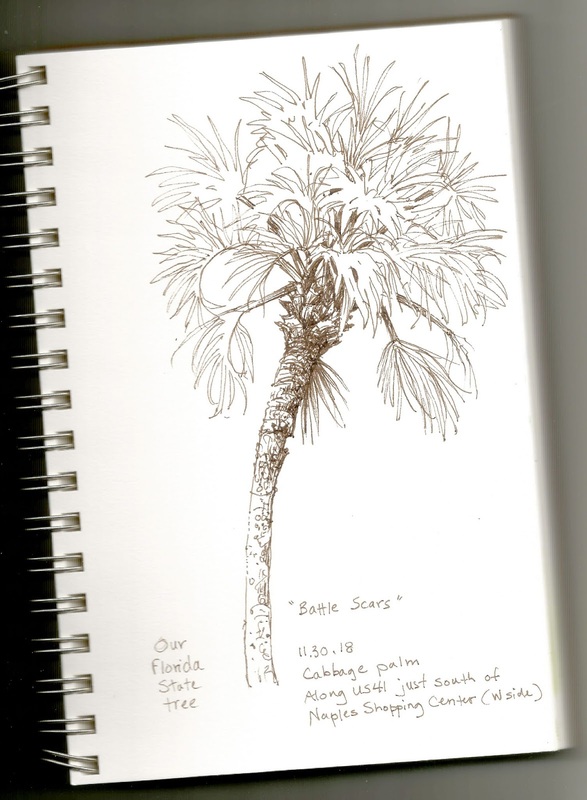 The palm I sketched has no boots except at the very top of the trunk; the pattern of ringed scars around the trunk are where the leaf bases once held fast. 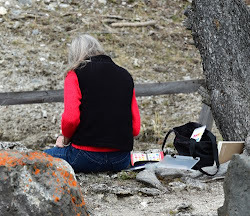 But there are also ravages from other escapades – perhaps a run-in with a large truck caused the deeper, ragged cuts near the top. The trunk is thinner at the bottom and fuller towards the top. Were there lean years and then better ones? It sits alone alongside a major roadway, out of place yet standing tall, but with a slight curve along the stem – leaning towards or leaning away? 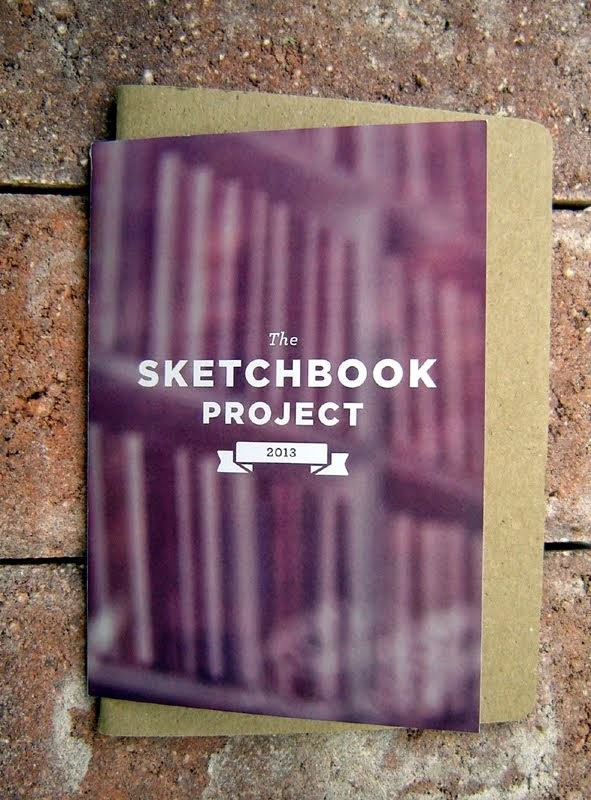 “Task: to be where I am. Ethnobotany from Native American Ethnobotany, A Database of Foods, Drugs, Dyes and Fibers of Native American Peoples, Derived from Plants.